When I was a child I spent a fair amount of time tooling around in the garage, no pun intended. Towards the front of his overcrowded tool bench my father had this old steel boiling pot. It was one of those giant pots you would boil food in, like 3 pounds of pasta for instance. In this pot he kept all of his hammers. 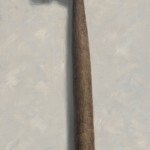 I would take out a hammer and use it for some random wood project and return it. I always saw this strange looking hammer in the pot and wasn’t sure what it was for or even what it was called. 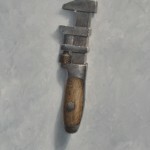 Once I got into painting tools, my father’s hammer stash was one of the first places I looked for still life items to turn into oil paintings. 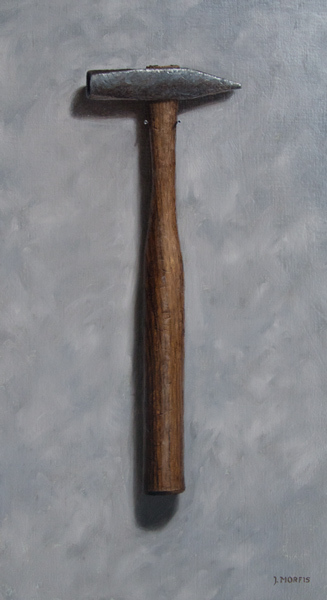 I finally decided to paint this weird hammer. While I’m still not sure of it’s exact purpose I have come to find out that it is a cross pein hammer thanks to the internet of things. It turns out that this was one of my favorite hammers to paint so far. I really like the way the wooden handle came out. I used many layers of raw umber, vandyke brown, burnt sienna, and yellow ocher to get the job done. All of the wood grain appears to be difficult to paint but I made sure I began with a precise drawing from which I transferred and worked on top of. 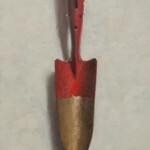 Upon close examination I realized that the slight shine of the tool’s wooden handle gave a subtle highlight right near the center of the handle and traveled upwards through most of the shaft. I noticed that this highlight was cooler in hue as compared to the warmth of the surrounding wood grain. In my younger days I probably would have reached for a tube of blue paint and most likely would have overdid the whole effect. Nowadays I have much more restraint and have realized that the key to realism is subtlety. Simply using a neutral gray next to all the warmer hues is enough to make the highlight seem cooler. This mode of thinking and methodology of paint mixing has really become an important part of my painting process. I keep a few neutral grays on my palette and I reach for those first when attempting to achieve subtle temperature changes within my artwork. If necessary I can always warm or cool the gray with an additional color. I am, however always surprised at how little I need to alter the pure grays when used in an actual painting! 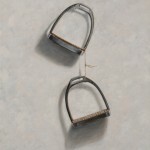 They may look useless on the palette but come to life when used next to colors in an actual painting. I was taught by most art teachers not us use black when painting. I adhered to that silly rule for most of my painting career but now I employ black and several grays in my paintings and have never looked back. At least not without regret. The grays I currently use are portland gray medium and portland gray light by Gamblin.